Electrospinning, an electro-hydrodynamic process, is a versatile and promising platform technology for the production of nanofibrous materials for tissue engineering and biomedical applications. Electrospun Materials for Tissue Engineering and Biomedical Applications, examines the rapid development of electrospun materials for use in tissue engineering and biomedical applications. 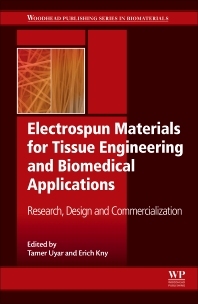 With a strong focus on fundamental materials science and engineering, this book also looks at successful technology transfers to the biomedical industry, highlighting biomedical products already on the market as well as the requirements to successfully commercialize electrospun materials for potential use in tissue engineering and biomedical areas. This book is a valuable resource for materials and biomedical scientists and engineers wishing to broaden their knowledge on the tissue engineering and biomedical applications of electrospun fibrous materials. Prof. Tamer Uyar obtained his Ph.D. degree from North Carolina State University, Fiber & Polymer Science program in 2005. Currently, he is an Associate Professor at Institute of Materials Science & Nanotechnology (UNAM) at Bilkent University, Ankara, Turkey. Prof. Uyar is very active in the field of Electrospinning of nanofiber by publishing over 100 peer-reviewed journal papers in this field with the interest of potential applications in Environmental/Filtration, Healthcare, Catalysis, Sensors, Food and Active Food Packaging, Energy, NanoTextiles and NanoAgriculture. Prof. Uyar is Founding Editor of the journal Electrospinning (by De Gruyter Open) and currently he is also serving in Editorial Board Member for Scientific Reports (by Springer Nature), Editorial Board of Journal of Nanomaterials (by Hindawi) and Editorial Advisory Board of e-Polymers (by De Gruyter). Prof. Uyar is the Vice-Chair of COST Action MP1206 for Electrospinning of nanofibers. As a young scientist, Prof. Uyar is the recipient of several prestigious International awards/fellowships including 2016 International Cyclodextrin József Szejtli Award and 2012 Fiber Society Distinguished Achievement Award and 2010 Marie Curie International Reintegration Grant (IRG) Fellowship. He also received numerous National awards given only under 40 years of age including 2014 TÜBİTAK Incentive Award, 2012 Turkish Academy of Sciences Outstanding Young Scientists Award (GEBİP), 2010 METU Parlar Foundation Research Incentive Award and 2009 Outstanding Young Scientist Award by FABED. Dr. Erich Kny, an expert in materials science and technology with a focus on metals and composite materials and surface technologies, is currently the CEO of KEMYK, an independent company specializing in the commercialization of new technologies. He has published over 100 publications, 3 book contributions and several patents and has edited the conference symposium proceedings at the EMRS 2009 on Polymer Nanocomposites. Dr. Kny obtained his PhD from the University of Vienna and has many years of academic & research experience, having been head of the Engineering Department at the Austrian Research Centre for 17 years as well as a university teaching assistant in the Department of Physical Chemistry of the University of Vienna, Austria. This is complemented by his long industrial experience as deputy head of R&TD at the company Plansee in Austria. He has founded in 2007 the scientific COST network on Polymer Nanocomposites (MP701) and in 2012 the scientific COST network on electrospun nanofibres (MP1206). In both of these scientific networks he holds the position of an action chair.